Alone on Valentine's Day? Don't fret, some of the most fabulous people including Scandal's very own Olivia Pope aren't in a relationship. Just because you don't have a person to whisper sweet nothings to on the big day, doesn't mean you can't have a totally awesome day fit for a Gladiator! Therefore, ABC has come up with "A Scandal-ous Guide on How to Date Yourself This Valentine’s Day" that has all your needs covered. First necessity -- snacks! Let's face it, you deserve to indulge a little on the day of loving celebration. There's no better way to do that than with Olivia's Pope's dinner of choice, wine and popcorn. Who says you need a real meal? Stock up on the popcorn and toppings of your choice and then wash it down some full-bodied vino, or if you are feeling like something a little sweeter try a wine cooler. Better yet, take advantage of all the apps these days who will deliver groceries right to your doorstep. A perfect date with yourself isn't complete without binge-watching your favorite TV show, which is obviously Scandal. Grab your snacks and catch up on Season 5's full episodes or catch Scandal Pops, featuring the most poppin' moments from the series for more of a quick refresher. Put on a white hat and strut your stuff around the city of your choice. It is a sure fire way to bring out the fierce Gladiator inside. Take a friendly peek at what your exes have been up to on social media. Unless of course your ex is the President, then that might be a little tough. Be careful though, because stalking from afar can be a slippery slope. Just ask Huck. Yes, this is supposed to be about dating yourself, but sometimes a quick call with a friend is just the trick to not feeling alone. Most likely your friend will want some kind of advice from you, which you will gladly dish out but not apply to your own life. Put on your favorite tunes and dance like there's no tomorrow just like Olivia and Jake did to avoid thinking about relationship issues. Power ballads by the likes of Stevie Wonder and Aretha Franklin sure do capture the necessary mood. Have yourself a good cry. Grab the hooch, go to the closet and just let it all out, girl. Sometimes a good tear-fest is better than therapy. There is no better way to have fun with yourself on Valentine’s Day -- while paying homage to how great you look -- than taking fun impromptu selfies. 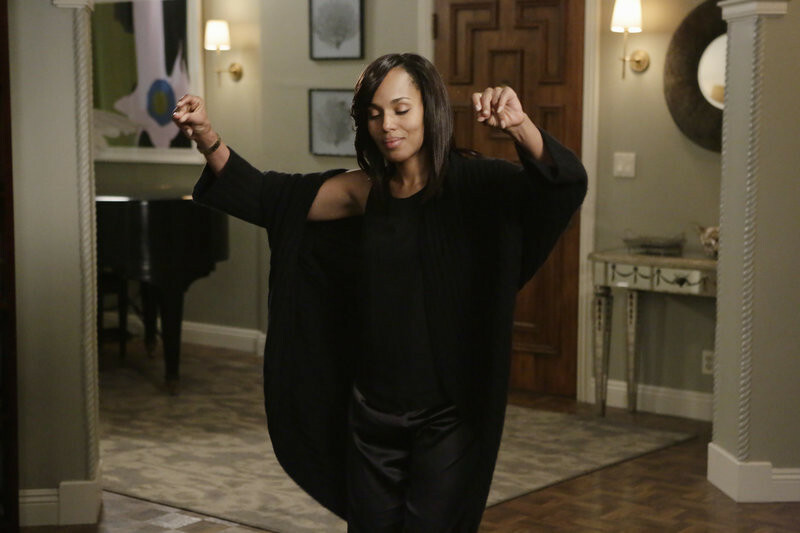 Just imagine how Olivia would strike a pose if she had to look FAB on command if you need inspiration. Then, you can build your very own photo collage that documents all the reasons why you’re so lovable. Whether it's a purse you're lusting over or chocolate covered strawberries, make that indulgent purchase. You deserve it! You know Olivia Pope would do the same! Watch all-new episodes of Scandal on THURSDAYS 9|8c!